In the last month or two I’ve started being more open with some of post-Christian Science friends about my Christian Science upbringing. Often, the people I’ve shared with have been people who never knew me while I was still “in Science” — or people who were not quite aware of my background and upbringing. Everyone has been supportive, but they’ve also been baffled as to why anyone would believe in Christian Science in the first place. How did you get into Christian Science? Why did you stay in for so long? I can only answer these questions for myself, but I welcome others to chime in on their experiences in the comments, or as a contributing post over at The Ex-Christian Scientist*. Like many Christian Scientists (and members of most religions) I was born into it. 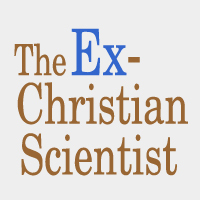 My father discovered and converted to Christian Science in the mid-1960s (he was in his mid-to-late 30s), and convinced my mother (who was in her mid-to-late 20s) to convert (in the late 1970s early 1980s) as well. They were strongly in the faith when I arrived on the scene in the early 1980s. My mother has argued I was “not raised quote in Science” and to some extent I agree, I was allowed to take biology classes in school, and got to sit through some very basic “our changing bodies” videos in elementary school. That did not prevent me from remaining relatively ignorant of human physiology and biology (the library and internet were helpful there), a very warped perspective of pain and illness, and a lasting discomfort surrounding all things medical. When you are raised with these ideas from birth and are repeatedly told them by people that you love, trust and respect it is hard to break free from them. Like many others, I was raised being told that Christian Science was the One True Religion, Ms. Eddy’s “time for thinkers has come” quote was great, and as long as my thought came back to CS as the OTR things were fine. After I moved out, the ingrained CS habits — not going to a doctor, “praying” about (or flat-out ignoring) problems, general ignorance of the human body/basic biology, etc. remained. Acknowledging health issues or other problems (aka “error”) gave them power and made them “real” and therefore even more difficult to “handle” in Science. My negative childhood experiences with dentists, and my mother’s very vocal anti-doctor/anti-medicine stance only reinforced my decision. In retrospect I’d been drifting away for years, what really made me examine my beliefs, and their implications, was having children. Christian Science promises amazing results. Committee on Publications bloggers regularly run articles about healthcare and quantum physics that make Christian Science appear to be a viable alternative to modern medicine and scientific. Spoiler alert: it is not. The Church has over 100 years of “testimonies” of healing attributed to Christian Science, as many Christian Scientists do not visit doctors, and are generally ignorant of human physiology, they regularly are healed of “what appeared to be” the worst-case-scenario from Dr. Google or a concerned friend. That’s a complicated one, I’d say I believed at least some of it. Did I really believe that prayer could heal? On some level, yes. Recent Christian Science propaganda has latched on to the “thought impacts health” and to some extent it does, but not to the extent Christian Science would like you to believe. If you want to pick it apart from a Christian perspective, Jesus did not teach that thought impacts health, and Christian Science has set about to restore the lost art of healing the way Jesus did. Did I really believe in the unreality of matter? I’m less sure of that one, I think that’s been one of the nagging questions that has lingered from when I first started forming questions. No one has ever given me a satisfactory answer to this question. I’m aspiring to be a humanist and generally reasonable human being. Some days I am better at this than others.